Timothy J Weckman, is the proprietor of Berea Bonsai Studio and Nursery, Berea, KY. Tim has had a life-long affinity for the natural world. Bonsai is an extension of this passion for nature. He has curated a public greenhouse for over 25 years and has a Master’s Degree in Botany. He has studied bonsai with many notable teachers and is an apprentice of Warren A. Hill, Retired Curator of the National Bonsai and Penjing Museum in Washington, DC. 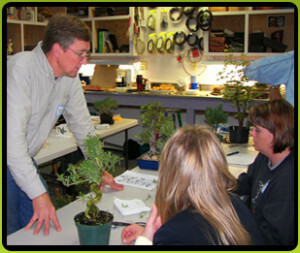 Tim opened Berea Bonsai Studio and Nursery in Berea, KY in 2008. He maintains an diverse and extensive collection of bonsai, pre-bonsai and raw stock trees. He may be contacted by phone: 859.582.1234 or by e-mail: tj.weckman@yahoo.com.